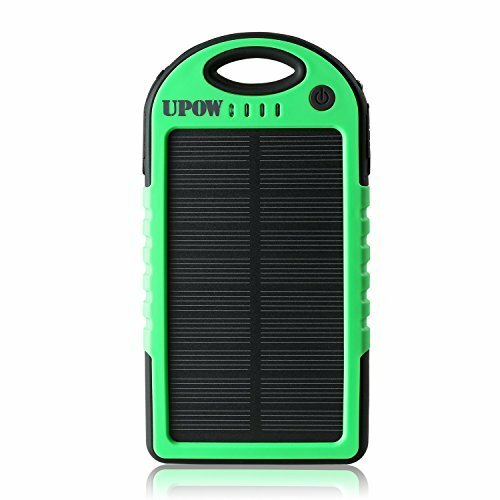 Home › Electronics › Upow 5000Mah Portable Charger Solar Power Bank Solar Panel Charger Fits Most ..
Upow 5000Mah Portable Charger Solar Power Bank Solar Panel Charger Fits Most ..
Color: Green/Black Why Upow Solar Charger? The BEST Combo of Portable External Battery Pack, Solar Panel and EmergencyLED Flashlight, not only for charging and backup but also for entertainment. Multifunctional Combo Upow Battery Pack continuously provides power to your hungry phones/tablets;the solar panel generates power for emergency; the LED light will light upyour surrounding at night. On-the-Go Solution Rugged built with great portability, you can hold it by hand, put it intopocket, hang it on your backpack or tent with the carabiner included in thepackage; every port is covered by rubber for weatherproof and shockproofprotection, very considerate for Outdoor Activities. Rapid Charging with Safety We use the world's safest battery: Grade A rechargeable Li-Polymer battery,which is easy to charge and can charge other device at a top speed, mostimportant, it's not possible to explode even over-heated; 1.2W monocrystallinesolar panel captures sufficient sunlight and converts it to power efficientlyfor emergency charging. Note: 1.Working Temperature: -20~60 degrees centigrade. Please do not place thecharger on over-heated surrounding for continuous charging to avoid built-inBattery swelling up. 2.The solar panel is mainly for emergency use, it won't fully charge thecharger for its compact size. We recommend charge Upow via an adapter orcomputer to shorten the charge time for daily use.